February is Spay/Neuter Awareness Month and today is World Spay Day!! For the pet population as a whole, spaying and neutering is the only way to effectively reduce overpopulation and unnecessary euthanasia in crowded shelters. Spaying and neutering also improves your pet’s health and longevity and may help reduce unruly behavior. The Humane Society of the United States has a great article on their website on the importance of spaying and neutering. We’ve included some of the information in the image below. Spaying and neutering have many benefits for both shelter pets and own furry family members. Many of our clients that rescue pets or have puppies and kittens have questions regarding the need for spaying and neutering and what is involved in the procedure. LVH’s Dr. Jennifer Boyle is here to answer those questions. When is the best time to spay/neuter my puppy or kitten? We generally recommend spaying/neutering pets at 6-8 months of age. However we prefer to tailor our recommendations based on each pet’s age, size, breed, physical confirmation, etc. so it is best to discuss the ideal age for your pet to be spayed/neutered with your veterinarian. Are there consequences or risks for spaying/neutering too early? There are some studies that suggest spaying/neutering too early can have a negative consequence on joint and skeleton development and may predispose some female dogs to urinary incontinence as they age. It is important to realize that spaying/neutering too late can have MANY negative health consequences such as testicular tumors and prostate issues for males and a life threatening uterine infection (“pyometra”) in females. A female that goes through several heat cycles also has a much higher risk of malignant mammary tumors when compared to females that are spayed at a younger age. Will spaying/neutering affect my pet’s personality? Spaying/neutering will not alter your pet’s personality. The only potential change you may see is a decrease in their overall metabolism so you should monitor their weight and body condition closely to be sure they are not getting excess daily calories that may cause obesity. There is a chance that aggression and dominant behaviors could subside some after a pet is spayed/neutered, but this is not always the case. A routine neuter involves a small incision just in front of the scrotum; the spermatic cord and vessels to each testicle is ligated and severed so that both testicles are removed through this incision. The incision is typically closed with absorbable sutures that will dissolve in a few weeks’ time. 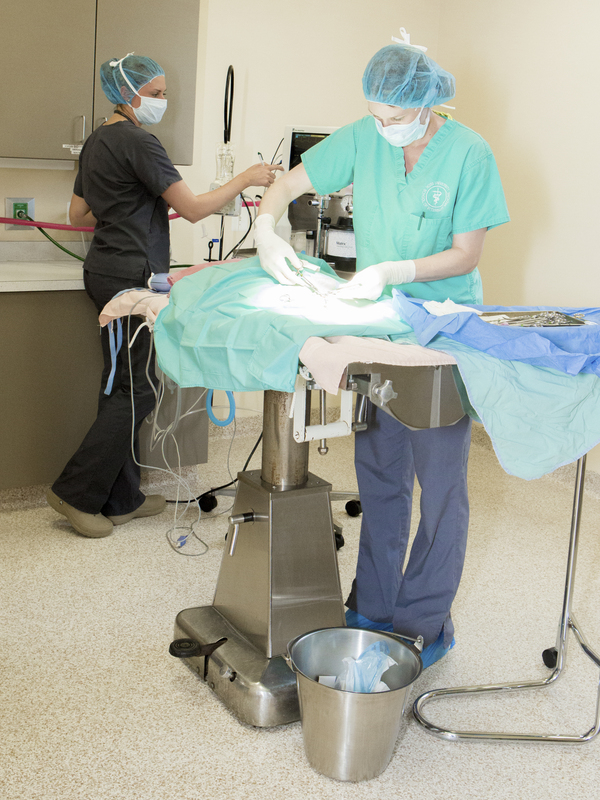 A routine spay involves a midline abdominal incision – the uterus and ovaries are excised, vessels ligated, and the abdomen is closed in several layers of absorbable suture. I’ve seen advertisements for reduced or free spay/neuter clinics. Why is the procedure at LVH more expensive compared to the reduced spay/neuter clinics? Some hospitals may have higher overall costs associated with their surgical procedures for many factors. At LVH, we have a licensed veterinary technician monitoring the pet at all times while the doctor performs the procedure. All or our pets have an IV catheter placed (essential in case of an emergency), receive warmed IV fluids (important to keep pets warm and maintain blood pressure and adequate circulation). We provide warm water blankets and air circulators to keep their temperature normal. We provide a local anesthetic block, as well as optimum pain control through injectable opioids and anti-inflammatories. And all of our patients are monitored with state of the art equipment (EKG, blood pressure, temperature, pulse oximetry, capnography) to ensure the safest anesthetic experience possible. LVH’s Spay and Neuter Surgery Day, Part 2: To benefit the Animal Welfare Society of Jefferson County, West Virginia. Sunday Surgery Day for a Good Cause at LVH: To benefit the Humane Society of Washington, County, MD. ← It’s Pet Dental Health Month! How well do you know your pet’s mouth?